Paddle your own canoe in the direction of your personal vision. 2010 St. Mary 50-miler canoe trip with Troop 182. 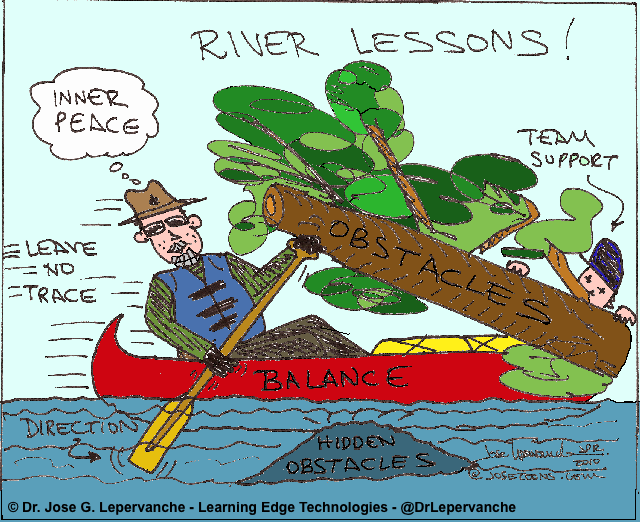 The River Lessons: Find the best direction, leave no trace, be aware of obstacles, especially hidden obstacles, support your team, be prepared for changes and emergencies, keep the balance and maintain inner peace. This entry was posted in Colortoons, Conferences, Learning Edge Technologies, Life Systems Management, Personal Leadership system, Scoutoons - Troop 182 - Jacksonville, Florida and tagged balance, Be prepared, canoeing, changes, emergencies, hidden obstacles, inner peace, obstacles, paddling, Scouting, vision. Bookmark the permalink.